Off course everyone knows this one, a weed in many gardens. 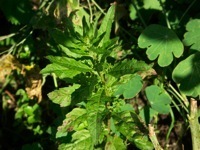 But this ‘weed’ once was something that was commonly eaten in Western Europe. We call the edible selections of dandelion (taraxacum officinale) molsla, in Flemmish. What happened in earlier days: the ‘mol’ or groundhog made his little mountains of sand or loam, and by doing that he accidentely covered some dandelions from time to time. These covered dandelions started growing during springtime, and they were still covered by the sand, so they blanched naturally. This blanching had an effect on the taste of the leaves: they lost their bitterness. So people started to imitate that process, and created varieties that could easily be blanched. Quite a bit of varieties were created, especially in France: amélioré à coeur plein, vert de montmagny amélioré,....And, yes, they do have a soft and tender taste, and they are one of the first vegetables in spring. Do I have to mention these are very easy to grow??? A perennial that’s mostly grown as an ornamental over here, almost all varieties sold in nurseries are intended for border planting . Too bad ,because day lily (hemerocalis spp.) has quite a bit of potential uses, especially Hemerocallis fulva, Hem. lilio-asphodelus, and some others have multiple uses for eating: flowers are a delight (even from the ornamental varieties), roots, young shoots, all are used (mainly in China, where some special selections exist). The plants are very easy to grow, but give them a bit of sun and space, they rapidly fill up an empty spot. I have been growing earth chestnut (bunium bulbocastanum) for over 10 years now, and it’s one of the better taste experiments in the garden, nice, sweet , a chestnut taste, but unfortunately small tubers, and a small harvest... I should select on this, it’s so good.....It’s an easy to grow , low staying plant, that remains perfectly green during wintertime. 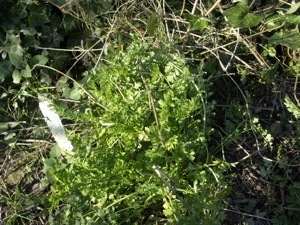 It produces small edible bulbs , the leaves are eaten as well, as some sort of parsley substitute. The plants re-sow a bit over here, but they can also be cut into pieces and replanted. They are not only heat-lovers, but they also want lots of moisture and nutritients to grow well. You will always get better results in some sort of greenhouse! Also known as escarole. Endives (cichorium endivia) are easy plants to grow, but they shouldn’t be sown too early, otherwise they could bolt. I prefer a late summer sowing, so they can grow out nicely . There are two ‘main’ groups: a ‘broad-leaf ‘ type with lots of different varieties, mostly light- to dark-green coloured, even yellow varieties exist. The other main group is a ‘curly-leaf’ section, again lots of varieties, white, yellow, green,..The best thing to do is to blanch the plants a bit (both groups), they taste less bitter when blanched. bean preparations. It apparently stimulates the digestion of the beans. Epasote (Chenopodium ambrosoides) is mainly used as a tea plant over here, but don’t add too much leaves, unless you like very strong tasting teas.The plants are surprisingly easy to grow, even reseeding quite abundantly (I even guess this could be somewhat invasive in other climates). There are some reports saying epasote contains toxic elements, so take care!